Now heading into his 18th season in the NFL, and fourth with the 49ers, we take a look at the career of veteran San Francisco 49ers field goal kicker Phil Dawson out of The University of Texas. Veteran kicker Phil Dawson attended the University of Texas at Austin during his young collegiate years (1994 to 1997). Dawson achieved first-team All-America honors his junior and senior years, while continuously making All-Big 12. Amazingly, and to no chagrin, he went undrafted in 1998 and was signed as an undrafted free agent by the Oakland Raiders. Soon after that, he was waived. Dawson was then later signed to the practice squad by the New England Patriots, with no game appearances under his belt while being part of their organization. With Dawson’s perseverance and patience, a window of opportunity would open up with the Cleveland Browns in 1999. During Dawson’s career with the Cleveland Browns (1999–2012), he holds the record for most consecutive field goals made with 29 and most in a game with six. He was a two-time second-team All-Pro in 2007 and 2012, respectively, and Pro-Bowler in 2012 as well. Also, he’s tied with Lou Groza for the Browns’ career field-goal record with 234. Dawson ranks ninth on the all-time list for most total field goals made in NFL history with 386, and he ranks 14th overall with 84.464 field goal percentage, as seen below. In Dawson’s first year with the 49ers, he made 27 consecutive field goals — a streak that was snapped by a 24-yard miss against Arizona Cardinals in Week 17 of 2013. His first year in a 49ers uniform, he had the second most points ever (140) in team history. Since joining the 49ers, in the last three years, Dawson has averaged at least an 85 percent field-goal rate, while maintaining extra point percentage of 98-plus. From long distance of over 50 yards, last year Dawson was a perfect three of three. Out of 48 games played for the 49ers, he’s only had three field goals blocked. A huge tribute and a testament to his leadership and preparation, he’s also like a coach of the field. Dawson’s durability and longevity speaks volumes as he makes his case for a Hall of Fame place in Canton, Ohio one day. Consider this, out of the last 17 years, Dawson has played in 263 games out of the 272 available. 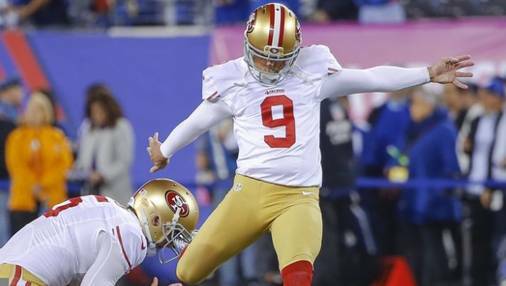 Dawson drew honors twice by being named NFC Special Teams Player of the Week (Week 14 and 17 in 2013) for the 49ers. If there’s a Hall of Fame for a class act, team player and ultimate professional, Dawson would be a unanimous selection.